prevents the card from being rezzed on the runner's next turn, so it cannot be used for tricks like midrun rez-and-trash of cards like Thomas Haas, or with Will-o'-the-Wisp. Ambushes work because they trigger on access, even if unrezzed. Great to bluff with Cerebral Overwriter, Project Junebug, The Future Perfect and Ronin. Six years ago I was surfing Amazon looking for games. I've always loved board/card games and was looking to start a collection of "real" games. Games that the developers had actually put thought into. Games that were focused on more than just the roll of the dice. I ended up buying Ticket to Ride - India: Map Collection Volume 2, Thurn and Taxis and one other game. The game had cool looking artwork, a fun theme and looked to be amazing amounts of fun. It reminded me of old trading card games I had tried to get into in the past. This game of course was Android Netrunner. I was not disappointed. Everything about the game was excellent. The asymmetrical game play, high-stake gambles, and exciting card combinations. Sadly, I didn't get to play it very much. I've never had the time or even real desire to play competitively. Not too many of my friends were into that kind of game. I purchased cards up to Honor and Profit before stopping. It sat sadly on my shelf while I looked longingly at it. Then a friend of mine found something. OCTGN; a way to play Android Netrunner online against other players. My love was revived and I spent a ton of time playing Netrunner again. OCTGN worked pretty well, but it was far from perfect. Eventually I found netrunnerdb.com, a place where I could read and write reviews of my favorite cards, along with finding cool ideas for deck building. The site continues to be one of my most frequented. I saw mention of another site, here on netrunnerdb; the site was jinteki.net. For months I just assumed it was another site similar to this one. When i finally actually visited it, and was sad it had taken me so long. Jinteki.net is so great. A strong player base, dedicated coders, and a perfect place to play Netrunner anytime. Today 6/8/18, I stumbled upon a sad article in my Google news. FFG's license on Android Netrunner is expiring and the game is coming to an end later this year. Reign and Reverie will be the last content added to the game. Why can't this license be renewed? I don't know. I wish that the game would continue forever. I have taken breaks from the game over the years. I currently haven't played in a few months (curse you, Rocket League). I've definitely done my share of complaining. But really I've always loved the game. I hope to continue playing on jnet for years to come. Thanks to the developers and artists and all others who made the game possible. Thanks to the people behind jnet, netrunnerdb and other fan sites. And thanks to the Netrunner community. This card is in my Blue Sun: Powering the Future deck and I adore it. Toss it into your deck along with a few Back Channels to recall it if the traps aren't sprung, and you've got it made. Vanity Project - If they don't run it, you've got 4 points. If they do, Punitive Counterstrike them. If the MWL succeeds in reducing the number of Clone Chips running around, I'll likely test this out with Aggressive Secretary, as well. 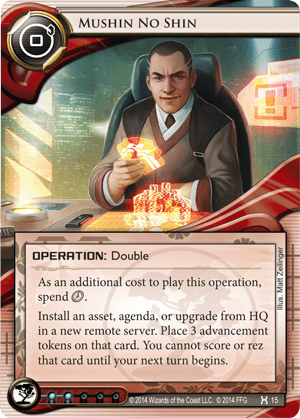 Fun card, great out of Weyland. Give it a try!